We've all seen an utterly ridiculous warning label or two in our lives. You know the ones I'm talking about - cautioning us to not use the coffee maker in the shower or iron our clothes while wearing them. The warnings that ensure the stupid people stay alive and keep breeding. 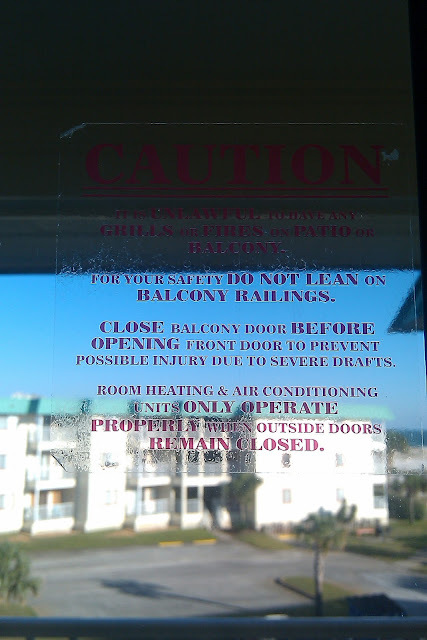 While staying in a lovely condo near Gulf Shores, Alabama this weekend, I encountered one of these warnings designed to interfere with Darwinism. Potential drafts of air warrant a warning? This is the Gulf Coast - an area that is battered by hurricanes on a regular basis. The very condo in which this warning was posted has probably flooded multiple times in its existence due to storm surges. Flooding, 10-foot waves, and 75 mph winds apparently aren't worthy of a warning. But "severe drafts" are. I'm willing to bet that some redneck dude already half a case of Bud Light down happened to be standing on the open balcony when his buddy that consumed the other half of the case opened the front door. Whether the ensuing draft or the Bud Light caused the fall, no one will ever know. But just in case it was the draft, the owners felt compelled to put up a warning. Welcome to Gulf Shores. The drafts are a b*tch. But the hurricanes are no problem.